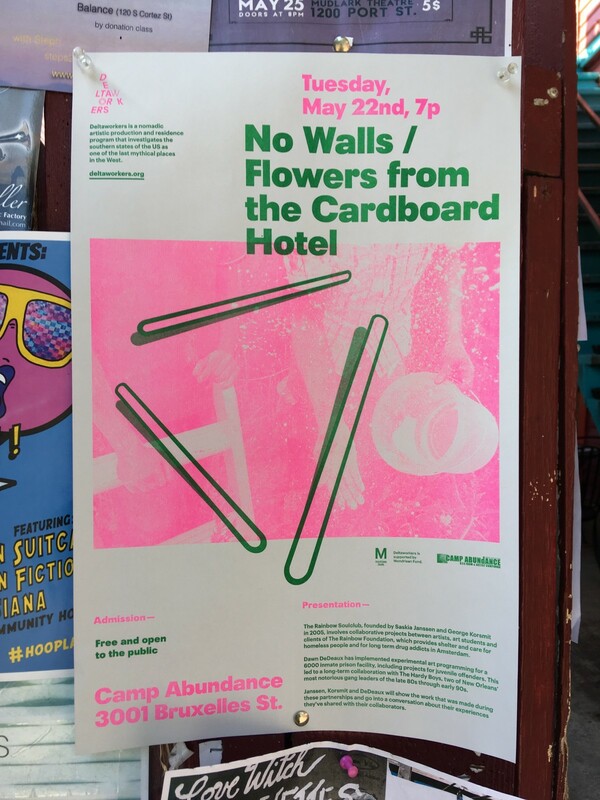 Tuesday May 22 at 7:00PM, presentation & discussion around issues with artistic social practices by Saskia Janssen, George Korsmit and Dawn DeDeaux, at Camp Abundance, 3001 Bruxelles St, New Orleans. The Rainbow Soulclub, founded by Saskia Janssen and George Korsmit in 2005, involves collaborative projects between artists, art students and clients of The Rainbow Foundation, which provides shelter and care for homeless people and for long term drug addicts in Amsterdam. Dawn DeDeaux has implemented experimental art programming for a 6000 inmate prison facility, including projects for juvenile offenders. This led to a long-term collaboration with The Hardy Boys, two of New Orleans’ most notorious gang leaders of the late 80s through early 90s. Janssen, Korsmit and DeDeaux will show the work that was made during these partnerships and go into a conversation about their experiences they’ve shared with their collaborators.